​Identify deep-seated implicit biases, explore how they impact decision making, and learn to recode them in a proactive and empowering way. This 5-part course focuses on gender biases and unpacks how biases impede equity & ways to bust through them. This class will help you identify deep-seated implicit biases that lead to snap judgments, and it will give you the tools to start recoding them in a proactive and empowering way. 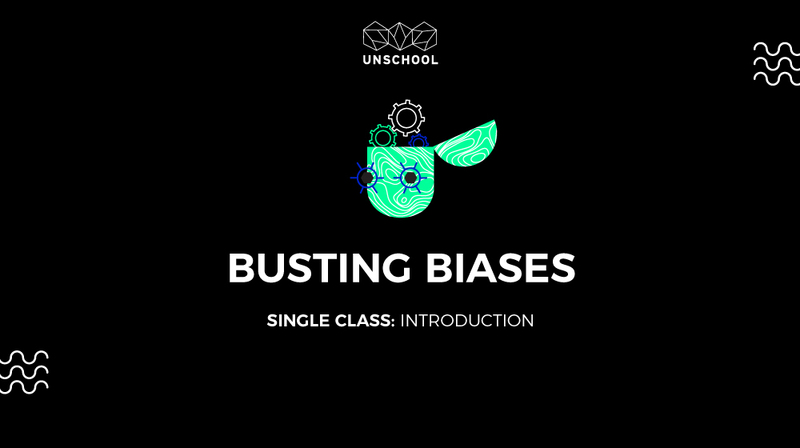 You'll learn about a whole suite of biases, including implicit biases, uncover the ways in which they affect decision making, and learn tricks for busting past them – both your's and other people's. You'll also uncover the background process that leads to biases in the first place – learning how our minds comprehend the world, filter information, trick us into thinking particular ways about things, and use the categorization strategy that can lead to reductive thinking. Through a fascinating case study on the research and development of the Gender Equity toolkit, you will discover how biases are perpetuating the status quo of inequity and will gain tools to overcome biases, build empathy and work towards achieving gender equity. By the end of this course you'll have developed more mastery over your cognitive processes, and, as a result, will be able to make more ethical and considered decisions in your interactions. Have you ever wondered how your brain makes such quick judgements and decisions, often without you consciously knowing it? This class will help you identify deep-seated implicit biases that lead to snap judgments, and it will give you the tools to start to recode them in a proactive and empowering way. We'll look at how a whole suite of biases, especially implicit biases, impact our decision making and show how you can start to come to grips with them to bust through them. We will uncover the entire background process that leads to biases – exploring how our minds comprehend the world, filter information, trick us into thinking particular ways about things, and use the categorization strategy that can lead to reductive thinking. This class takes a specific focus on gender biases, providing a fascinating case study on the research and development of the Gender Equity Toolkit that uses empathy to build pathways to equity in the workplace. The toolkit development process uncovered fascinating insights into the way stereotypes form and how to quickly identify and recode them. Ultimately, this class will help you gain more mastery over your cognitive processes so you’ll be able to make more ethical and considered decisions in your interactions. Let’s get started! This 5-part course unpacks the inner workings of the human brain, the influence of neurochemicals and social norms have on us, cognitive dissonance, how to identify and recode biases that impede our thinking, and ways this helps make change.